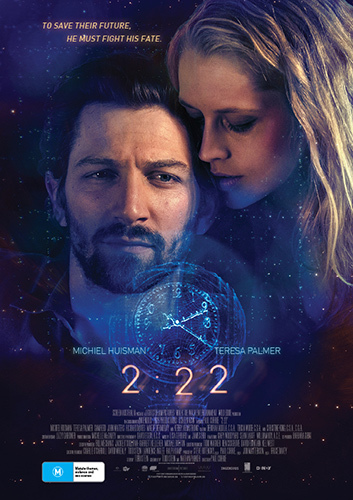 Australia’s Teresa Palmer ('Hacksaw Ridge', 'Warm Bodies') stars alongside 'Game of Thrones’' Michiel Huisman in a story of a love that will not die and lovers who may not survive. Air traffic controller Dylan (Huisman) lives his life each day with consistent precision, but nevertheless senses something is missing. An ominous pattern of events becomes evident as it starts to repeat itself in exactly the same manner, at exactly 2:22pm every day. When he crosses paths with the beautiful Sarah (Palmer) they both feel a sense of connection, but little do they know they share a bond that transcends time itself. The '2:22' competition has now closed. Winners will be announced shortly. Competition opens at 5pm AEDT on Sunday 11th February 2018 and closes at 11:59pm AEDT on Sunday 18th February 2018. Five winners will be chosen at random on Monday 19th February 2018. To successfully win, entrants must fulfil the above entry conditions before the time the competition closes. Current members/followers are eligible to enter the competition. Only one entry per person. Only one winner per household. To be a valid winner, the entrant must not have won a prize from SWITCH within the last 28 days. Each winner will receive one double pass to '2:22'. By entering, you agree to receive occasional emails from SWITCH in the future. If you decide to unsubscribe from these updates, any further entries will not be applicable. Only Australian residents are eligible to enter. '2:22' is in cinemas from Thursday the 15th February 2018 through Icon.